This is going to be a slightly different approach to my normal reviews. I received this great pack from the good people at SEEK Outside and as the timing was not fantastic for testing we agreed to doing a flash review that really highlights the pack features and my initial thoughts. I will revisit this review later in the year when I have had time to really put this pack through the ringer. I cannot wait! When the pack arrived at my door I was so excited. I pulled the pack out of the box and my first thought was “man this is light”. The pack was very pleasing to the eye as it was in a multi cam pattern and was equipped with the tan colored Talon accessory. Overall the pack looks fantastic and I have nothing to complain about. My next area of inspection was the Revolution Suspension System. It is unique and unlike others that I have used. The waist strap and lumbar support are much freer moving than anything I have used in the past. The shoulder straps are ergonomic and well padded. As with all good packs the suspension system is equipped with load leveling straps that can be pulled to bring the load forward. An integrated rifle sling holder is an attractive feature for anybody who had packed with a rifle. The frame is constructed of high quality and more importantly light weight I found the suspension to be very comfortable feeling with an initial testing load weight of one daughter or 34 pounds of giggling and shifting weight. Judging by the above comment I’m sure that you have gathered that the bag size must be roomy. The Fortress bag is rated at 4800 CI with additional 1000CI available with Talon accessory. The Fortress is equipped with a roll top type closure. Sure, there are lots of bags out there that offer space, color options, pocket options, and many other things. The real question is how many offer true waterproof capability? With the Fortress you will enjoy true waterproof construction. Yes, I said waterproof. What a fantastic idea! This eliminates the need for a cover and/or only makes use of a cover a redundancy. As with most other bags there are two small side pockets that would accommodate most water bottles or could be used for trekking poles. The bag has compression straps on either side to make sure loads can be secured. The bag is as functional as it is aesthetically pleasing. I cannot wait to get it into the backcountry. The Talon accessory provides another storage area for water bladders or anything else you can dream up. It also creates another compression area between the Talon and the bag that could be used to hold coats, wet rain fly’s, or just about anything else you can fit. It is light weight and there are several options available. The last feature that I was excited to see was the packs ability to do the job of many. When out on a summer backpacking trip the idea of hauling out meat is probably not on your mind. When September/October hit it is probably at the forefront of your mind. So, what is a guy to do? Well, many pack manufactures have developed a system to carry loads between the frame and the bag. SEEK can be counted among them. What is the point of this you might ask? Well, the idea is simple. The closer the weight is to your body the more stability and support you will have. Having the ability to secure a large elk quarter, bear hide, or any other random meat load is a fantastic addition to what appears to be an already outstanding pack. This is especially attractive to the backcountry hunter as you never want to waste a trip. Having the ability to carry both an initial meat load and your camp at once is almost a necessity. My overall attitude towards this pack is very high. It feels good, it looks good, and it is made in the great USA, and with a lifetime warranty on material and workmanship, you can buy with confidence. 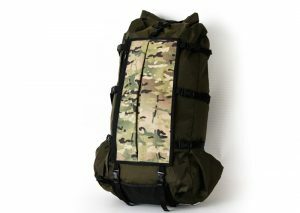 The bag was formerly sold as Paradox Packs and is an updated version of the Evolution which was manufactured by SEEK OUTSIDE. This pack and frame seem to be great. I only have one small critique of the side pockets for water bottle storage. I would like to see them have more of an elastic top. I like the convenience of elastic as he helps to keep things secure. It is not a functionality issue but rather my personal preference. I will address further concerns, if there are any, with my follow up review. Flash review is 5 stars.